I'm convinced that I have fine lines and wrinkles. Most people tell me I'm crazy, but I know they're there. Maybe those lines near my eyes are smile lines -- in all actuality, I do smile and laugh quite a bit -- but come on, I still don't want crow's feet. That's where Givenchy Radically No Surgetics Complete Age-Defying Care comes in. This moisturizer is one of the most lush, rich and luxurious ones I've come across in recent years. It's so amazingly creamy, and it just makes me feel like royalty when I slather it on. And slather I do, because the 1.7oz tub contains quite a bit of product that lasts seemingly forever without ever running out. It honestly feels bottomless no matter how much I rub into my skin! And while I'm on the subject of packaging ... it's fit for a queen, it really is. The light purple tub glistens and gleams atop my vanity, and seems to beckon to me each evening, just begging for me to dip into it once again. Since I started using this moisturizer about three months ago, I've noticed dramatic changes in my skin. It's more radiant and refined, there are fewer dry patches and breakouts, and the texture is quite smooth. Not to mention it's keeping the wrinkles at bay! 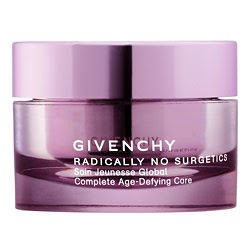 Givenchy Radically No Surgetics Complete Age-Defying Care retails for $145 at sephora.com. It's expensive, to be sure -- but let's be honest, it's cheaper than the otherwise unavoidable Botox injections. How are Botox injections unavoidable, exactly? At 22 I don't have any wrinkles, but I know I'll never be tempted to look tight and expressionless. Are you saying that this cream will take the place of botox? If so, sign me up! But wow, I have never heard that claim made about a face cream. If this is true, they can charge 10x the price for this.